Hey! Welcome to Master Organic Chemistry, just in case you’re a first time visitor. In this blog post I explain how to calculate formal charge for molecules. However, you might find my videos containing 10 solved examples of formal charge problems to be even more useful. Just thought you should know! Formal Charge = [# of valence electrons on atom] – [non-bonded electrons + number of bonds]. Let’s apply it to some examples. for example BH4 (top left corner). The number of valence electrons for boron is 3. The number of non-bonded electrons is zero. The number of bonds around boron is 4. The formal charge of B in BH4 is negative 1. The number of bonds around carbon is 3. The formal charge of C in :CH3 is negative 1. Same formal charge as BH4! Let’s do one last example. Let’s do CH3+ (with no lone pairs on carbon). It’s the orange one on the bottom row. You can apply this formula to any atom you care to name. Here is a chart for some simple molecules along the series B C N O . I hope beryllium and fluorine aren’t too offended that I skipped them, but they’re really not that interesting for the purposes of this table. Here’s a question. 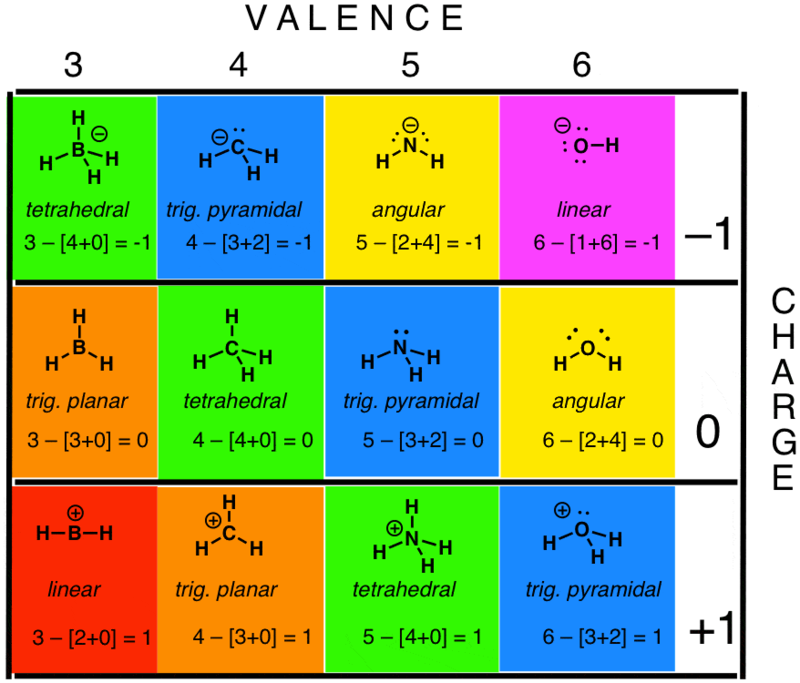 Alkanes, alkenes, and alkynes are neutral, since there are four bonds and no unbonded electrons: 4 – [4+0] = 0. For what other values of [bonds + nonbonded electrons] will you also get a value of zero, and what might these structures look like? (You’ll meet some of these structures later in the course). One final question – why do you think this is called “formal charge”? Think about what the formal charge of BF4 would be. Negative charge on the boron. What’s the most electronegative element here? Fluoride, of course, with an electronegativity of 4.0, with boron clocking in at 2.0. Where do you think that negative charge really resides? Well, it ain’t on boron. It’s actually spread out through the more electronegative fluoride ions, which become more electron-rich. So although the “formal” address of the negative charge is on boron, the electron density is actually spread out over the fluorides. In other words, in this case the formal charge bears no resemblance to reality. Glad you found it useful Peter! The answer to the question in the post above is “carbenes” – they have two substitutents, one pair of electrons, and an empty p orbital – so a total of four electrons “to itself”, making it neutral. Shouldn’t the formal charge of CH3 be -1? I was just wondering because in your example its +1 and in the chart its -1. In CH3 i think FC on C should be -1 as carbon valency is 4 it has already bonded with 3 hydrogen atom one electron is left free on carbon to get bond with or share with one electron H hence, number of non bonded electrons lone pair of electrons is considered as 2. 4-(2+3) = -1. In your case if we take 0 than valency of c is not satisfied. Great!i can use this for my exam!thanks! There are meny compounds which bears various structure among these which one is more stable or less energetic is it possible to predicu from the formal charge calculation? If formal charges bear no resemblance to reality, what are their significance? I hope the post doesn’t get interpreted as “formal charges have no significance”. If it does I will have to change some of the wording. What I mean to get across is that formal charges assigned to atoms do not *always* accurately depict electron density on that atom, and one has to be careful. In other words, formal charge and electron density are two different things and they do not always overlap. Formal charge is a book-keeping device, where we count electrons and assign a full charge to one or more of the atoms on a molecule or ion. Electron density, on the other hand, is a measurement of where the electrons actually are (or aren’t) on a species, and those charges can be fractional or partial charges. First of all, the charge itself is very real. The ions NH4+ , HO-, H3O+ and so on actually do bear a single charge. The thing to remember is that from a charge density perspective, that charge might be distributed over multiple atoms. However, if one thinks about where the electrons are in H3O+, one realizes that oxygen is more electronegative than hydrogen, and is actually “taking’ electrons from each hydrogen. If you look at an electron density map of H3O+ , one will see that the positive charge is distributed on the three hydrogens, and the oxygen actually bears a slight negative charge. There’s a nice map here. When we calculate formal charge for H3O+, we assign a charge of +1 to oxygen. This is for book keeping reasons. As a book-keeping device, it would be a royal pain to deal with fractions of charges like this. So that’s why we calculate formal charge and use it. Sometimes it does accurately depict electron density. For example, in the hydroxide ion, HO- , the negative charge is almost all on the oxygen. If you have a firm grasp of electronegativity then it becomes less confusing. Glad it was helpful Haley! Thank you very very more for the simple explanation! Unbelievably easy and saves so much time!!!!!! This works! I would take your class with organic chemistry if you are a professor. I am taking chemistry 2 now. Organic is next. you said that non bonded electrons in carbon is 2, but how ? If the charge is -1, there must be an “extra” electron on carbon – this is why there’s a lone pair. If there was only one electron, it would be neutral. I am beryllium and i got offended!!!!! !……..LOL Just kidding…….BTW, I found this article very useful.Thanks!!!!!!!!!! Should be 1/2 [# of bonding ELECTRONS] + # unshared. = 0 for ch3 radical. Should be for CH3(+), not the methyl radical •CH3 . Thanks for the easy approach. I have a problem in finding the FC on each O atom in ozone. Can you help me with that ASAP? FC on O atom with coordinate bond would be: -1 because [6-(6+1)]. FC on O atom with double bond is: 0 because [6-(4+2)]. Hope I solved your question! That analysis would be accurate for the methyl radical. However it fails for the methyl carbocation. That example referred to the carbocation. For the methyl radical, the formal charge is indeed zero. This really helped for neutral covalent molecules. However, I’m having trouble applying this technique for molecules with an overall charge other than 0. For instance, in (ClO2)- , the formal charge of Cl should be 1. However, with your equation the charge should be 0. With the conventional equation, the charge is indeed 1. Thanks for the study guide.